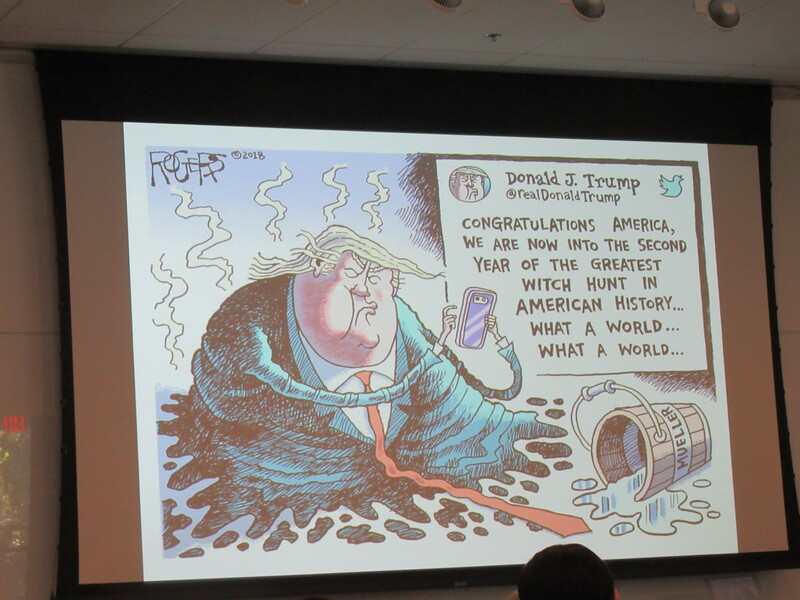 I expected Rob Rogers‘ session — the second of two “Cartooning in the Age of Trump” presentations at CXC — to be the highlight of my weekend, and it was. The above two panels from his 24-panel Nib cartoon, “I Was Fired For Criticizing Trump,” which ran in July, provide an insight into why. Some cartoonists work in fury, others deliver detailed analysis, but Rob is one of a handful of really nice guys with a really sharp pen, and, as this pair of panels indicates, he manages to combine a gentle, nice-guy personality with a really biting, insightful wit. Here’s the key: Drawing his younger self with hair is funny, but he mixes in the realization that, with maturity should come, too, a devastating level of self-criticism. This stuff doesn’t just fall out of the pen and onto the page. It’s not enough to be angry, it’s not enough to be analytical and it’s sure not enough to be funny. A good political cartoonist is all three, and, even at moments when one of those aspects rises up to dominate a piece, the other two are present or the piece almost certainly fails. Well, you had to be there, because, while that Nib piece is a great encapsulization of the way Rob’s managers gradually forced him out of the position, the real impact came in hearing a genuinely nice guy detail, piece by piece, the harassment he went through. The term is “constructive dismissal,” and it amounts to harassing a person into quitting so you don’t have to pay unemployment or any other form of severance, short-term continuation of health care coverage, etc. Or, more often, no explanation at all. And sometimes clear proof that the piece had been rejected unseen. The impact of which, on his audience, was amplified — as it had been for the fans who had followed him for over a quarter century at the newspaper, as it had been for his friends within the industry — by his combination of nice-guy persona and penetrating wit. And, really, what more should a political cartoonist do but make his audience become engaged, sympathetic and energized by his point of view? Particularly since Rob isn’t the only cartoonist being silenced because his politics don’t gibe with management, what with management no longer being part of the local community. The post-script being that Rob reports that his freelance career is doing well and that he’s got a book coming out later this fall which I will profile when it’s available. 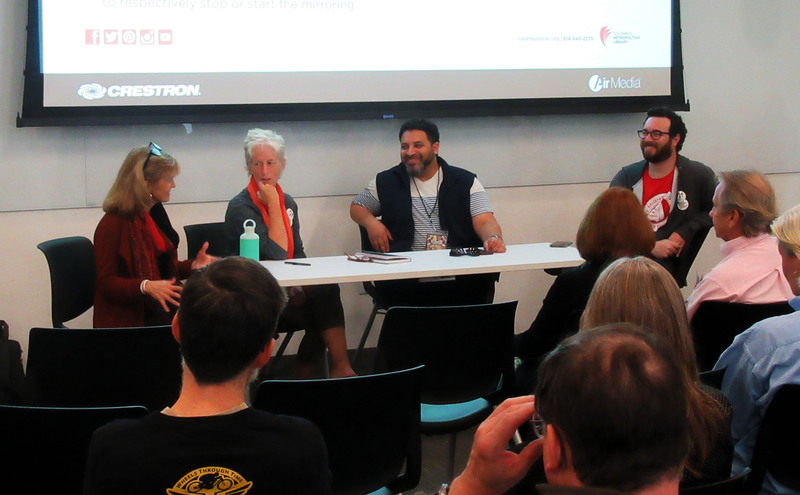 The other political cartoonist session at the gathering featured Ann Telnaes, Signe Wilkinson, Darrin Bell and Nate Beeler in a discussion of the process that provided the audience with the kind of overview that even fans of the form aren’t able to get simply from seeing the finished work. Some of it was dry, some of it was funny, and then a particular topic would rise up and spark particular insights, the best of which came in discussion of the Serena Williams cartoon that had sparked controversy not over whether Serena should be criticized for losing her composure but over how to depict her. Serena Williams does not have large lips, and it is racist to use that standard Jim Crow concept in a caricature of her. But Bell took it farther to suggest that, if an African-American has larger lips in relationship to other African-Americans, it’s appropriate to emphasize them. But if they are only larger than those of the average white person, making them even larger is racist. And the other, crucial, part of that piece of conversation was that sometimes — race issues aside — a straight depiction is more appropriate than a more distorted caricature. With Telnaes adding that there need to be more political cartoonists of color providing more accurate insights into an increasingly diverse public. At which point, I’ve eaten up most of my self-allotted 1,000 words, so let’s cut to next year. AAEC will be holding their annual convention in connection with CXC in 2019, which will result in many more political cartoonists being present and several more political cartooning presentations being made. This benefits AAEC, where more freelancers and fewer staff positions has made it hard to stage a full-bore, free-standing three-day convention each year, and it will help CXC grow from a regional comics book gathering into something with a greater national presence and more depth in its offerings. And maybe some of those young cartoonists will be inspired to turn their attention, and their pens, to political issues, fulfilling Telnaes’s wish for a deeper pool among political cartoonists, in a form which, she notes, is already far more than single panel cartoons on printed editorial pages. So, watch the dates — Sept 26-29 — and consider attending. I was disappointed not to be able to do both the AAEC convention last week and CXC this week and in 2019, that choice won’t be necessary. Also, keep your eyes on Macanudo, which is new at King Features but very well-established in Argentina. The first few cartoons over at Comics Kingdom were a bit, well, gentle and winsome, I guess you’d say, but they’re starting to mix it up more, and the cartoonist, Liniers, explained that he not only never wanted a strip with the same cast and setting each day, but he didn’t even want the same type of humor each day. Which is enough to get my attention. He’s also a hilarious raconteur, whose English is quite good and contains not only a number of F-bombs but, despite his self-depiction as an academic screwup who only wanted to draw cartoons, a surprising number of apropos references to people like Marcel Proust. As well as to Matt Groening, who married a friend of his sister, whose kid — the friend’s kid, not the sister’s — roped him into drawing sketches for most of the kids in the school, but that’s another story. 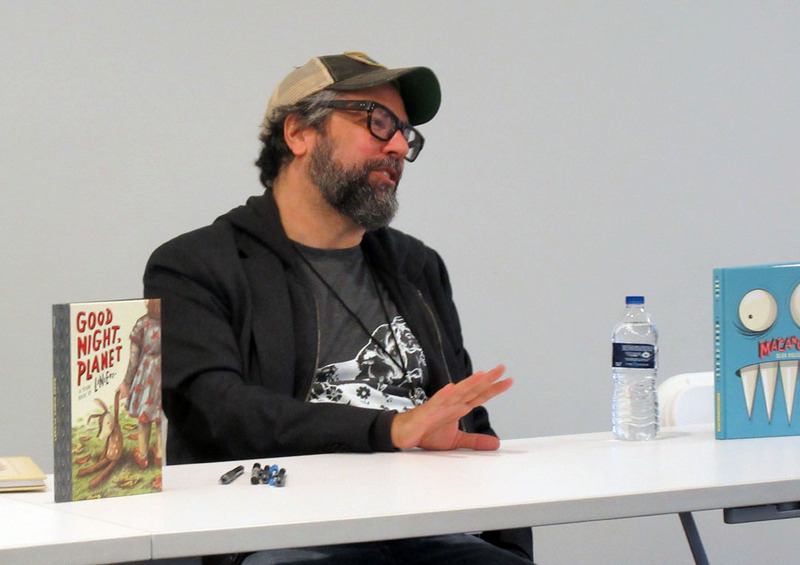 As is the similar story of how Liniers had the brilliant idea of doing a book for which he would personally sketch each cover, and then got several thousand, not a couple of hundred, orders. And how the three main papers in Argentina each hire a half-dozen cartoonists, who then become your heroes. Only those slots are lifetime appointments, so, if you want to be a cartoonist, you have to hope one of your heroes dies. Anyway, if this guy is at all typical of upcoming young artists from other countries, well, it’s more competition but it’s also some fresh, sparkling blood, which we could use. There’s more to tell, but I’m well over my appointed length and I’ve got to get out of here and go visit Lucy and Ricky Ricardo, upon whom I will report tomorrow. I expect Rob Rogers gave the same slide show I saw at AAEC, although you got some different commentary. He is a genuinely nice guy who seems more nonplussed than enraged by what happened to him. I also expect that professionally he’ll be just fine. Darrin Bell makes good points I haven’t heard anyone else make. Interesting panel. It sounds like 2019 may be the year I figure out how to get to Columbus, Ohio. Sorry, Bell’s explanation of how to correctly draw African American people’s lips is absurd. You can observe Serena’s lips and see they are big and beautiful. Maybe we could even do a google search of Serena’s lips and see what comes up? Big. beautiful lips. Draw them well and let the feigned outrage scream into the wind. I love how people begin their point with “sorry,” as if what they’re about to say carries such weight and authority that they’re going to single-handedly crush someone’s dreams. Go ahead, please do an image search of Serena Williams, as I did. Then do an image search of “black people” (if you need to). Her lips are “big and beautiful.” But they’re no bigger than the average black person’s lips. So if they stand out to you, and that’s what you choose to emphasize, then the only “absurd” thing here is your caricature. Sorry. That’s doublespeak. They’re big and beautiful but don’t draw them big and beautiful? Keep stoking that logic. “Sorry,” that’s a lie. I did not write anything even close to “they’re big and beautiful but don’t draw them big and beautiful.” I wrote they’re “big and beautiful, but they’re NO BIGGER than the average black person’s lips.” That shouldn’t be a hard concept to grasp. In any case, the guy drew her lips to take up half her face. They were not drawn “big and beautiful,” they were drawn enormous and grotesque. Any cartoonist with even a passing familiarity with the shameful history of Jim Crow-era cartooning should be able to realize the difference. So draw them small. Got it. Makes sense. 27 queries in 0.168 seconds.